importGeometry(model,geometryfile) creates a geometry container from the specified STL geometry file, and includes the geometry in the model container. gd = importGeometry(model,geometryfile) also returns the geometry to the MATLAB® workspace. Import STL geometry into a PDE model. 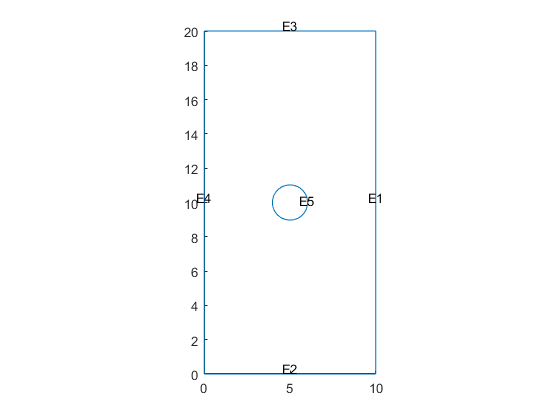 Create a PDEModel container for a system of three equations. Import geometry into the container. View the geometry with face labels. Import a planar STL geometry into a PDE model. When importing a planar geometry, importGeometry converts it to a 2-D geometry by mapping it to the X-Y plane. View the geometry with edge labels. Path to STL file, specified as a character vector or a string scalar ending with the file extension .stl or .STL. Geometry description, returned as a DiscreteGeometry object. 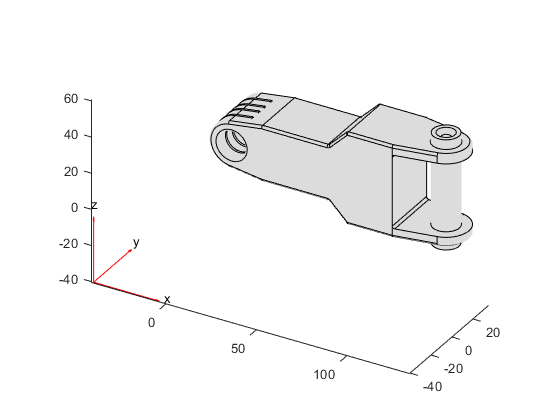 See DiscreteGeometry Properties for details. importGeometry does not allow you to import a multidomain 3-D geometry unless all of its subdomains are separate. In other words, the subdomains of the geometry cannot have any common points. Because of this limitation, you cannot import nested 3-D geometries directly. As a workaround, you can import a mesh and then create a multidomain geometry from the mesh by using the geometryFromMesh function. STL format approximates the boundary of a CAD geometry by a collection of triangles, and importGeometry reconstructs the faces and edges from this data. Reconstruction from STL data is not precise and can result in a loss of edges and, therefore, the merging of adjacent faces. Typically, lost edges are the edges between two adjacent faces meeting at a small angle, or smooth edges bounding blend surfaces. Usually, the loss of such edges does not affect the analysis workflow.